A database of foods that contain sodium added during preparation helps public health officials track sodium-reduction efforts. Click the image for more information about it. Over 90 percent of the U.S. population consumes more than the recommended daily maximum amount of sodium, most of which comes from commercially processed and restaurant foods. Reducing sodium in these foods is key to lowering the amount in the U.S. diet. United States Department of Agriculture (USDA) scientists and collaborators have launched an online dataset of key foods that contain sodium added during preparation or processing, prior to purchase by consumers. Researchers in USDA's Agricultural Research Service (ARS) Nutrient Data Laboratory (NDL) in Beltsville, Maryland, have been working on the project to monitor key high-sodium foods since 2010. Collaborators include the ARS Food Surveys Research Group, the U.S. Centers for Disease Control and Prevention, and the Food and Drug Administration (FDA). The ARS laboratories are part of the Beltsville Human Nutrition Research Center. The foods being monitored serve as indicators for assessing changes over time in the sodium content of common sodium-contributing commercial foods, according to NDL nutritionist Jaspreet Ahuja, who heads the project at ARS. Foods included in the dataset are commonly reported as eaten by survey respondents during the national food-intake survey called "What We Eat in America." The nutrient content of the foods is tracked year-to-year and also at intervals using objective, nationwide sampling and laboratory analyses to gauge important nutrient content changes, including reformulations. To establish a baseline, all foods in the database were sampled and chemically analyzed between 2010 and 2013. Researchers observed a wide range of sodium levels among foods studied. For example, among canned tomatoes, some had 4.5 times more sodium than others. 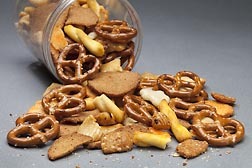 Among foods categorized as savory snacks and crackers, plain tortilla chips had one-quarter the sodium of hard pretzels. Most of the foods sampled (88 percent) from fast-food outlets or restaurants exceeded the "healthy" FDA sodium limit. Public health officials can use the information to track sodium reduction efforts, and consumers and health professionals can use the information to make educated food choices. The dataset is available on the NDL home page and may be found here. ARS is USDA's chief intramural scientific research agency. Read more about this work in the January 2016 issue of AgResearch.